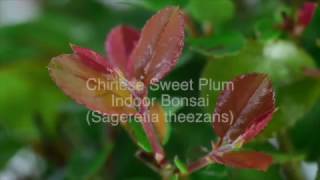 The Chinese Sweet Plum is one of the most beautiful bonsais offered by Bonsai Direct. With shiny red tones revealed by the flaky bark and complimented by the rusty tint of the vibrant foliage, this bonsai will look lovely in any room of the house and will make a perfect first bonsai for beginners. In summer months delicate white flowers bloom on the pads of foliage, which then die back to allow attractive plum-shaped fruits to grow.